Petah is using Smore newsletters to spread the word online. 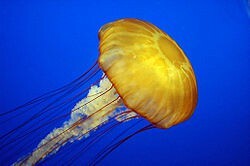 Jellyfish are found all over the world, from surface waters to the deep sea. Scyphozoans (the "true jellyfish") are exclusively marine, but some hydrozoans with a similar appearance live in freshwater. Large, often colorful, jellyfish are common in coastal zones worldwide. Jellyfish eat many different types of things, such as small plants (phytoplankton), copepods (crustacean zooplankton), fish eggs and other small fish called larvae; they also eat the planktonic eggs and young stages (also called larvae) of many different kinds of marine animals. Some jellyfish even eat other jellyfish! 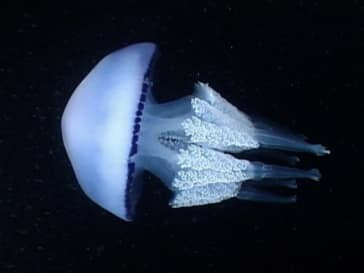 The jellyfish body looks like a bell or umbrella. A short tube, which contains the mouth, often hangs from the centre of the body. The edges of this tube can form four to eight frilly projections called oral arms. Another group of projections, called tentacles, hang down from the edges of the body. Each kind of jellyfish has a certain number and length of tentacles. Some kinds possess tentacles more than 100 feet (30 meters) long. Jellyfish often produce eggs. The eggs develop into small planulae with hairlike body parts. The planulae, in turn, develop into polyps, which usually look like cylinders with tentacles. Polyps often attach themselves to hard surfaces on the sea bottom. Immature medusas grow from the polyps by a process called budding. An immature medusa, after reaching a certain size, may detach from the polyp and develop into a mature jellyfish.